“Exit Through the Gift Shop” that tells multiple stories and is, believe or not, multiple films rapped within one. The main focus of “Exit Through the Gift Shop” is on Thierry Guetta, an eccentric French-American man who is obsessed with filming everything he sees. Thierry’s annoying filmmaking begins to find a purpose once he gets sucked into the world of street art, meeting such famed street artists as Shepard Fairey. One day, Thierry is asked to become the personal filmmaker to the most famous, most elusive modern street artist: Banksy. 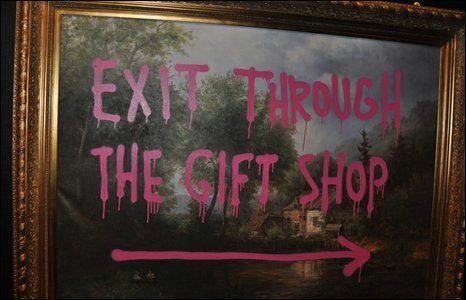 Banksy also directed “Exit Through the Gift Shop.” Discuss. The interesting thing about describing “Exit Through the Gift Shop” is that it may sound like I’m describing a narrative film rather than a documentary. That’s because “Exit Through the Gift Shop” does a better job than most modern documentaries at taking its parts and constructing a coherent whole. “Exit Through the Gift Shop” proves that Inception can be a real thing: once an idea is planted in someone’s head, it can never be eradicated. Once the idea that this movie might be a hoax comes to mind, it makes almost too much sense. “Exit Through the Gift Shop” is either the best documentary or the funniest comedy of the year, or both. However, Guetta seems almost too strange to have ever been invented. At first, he is likably ambitious. After a little twist, he begins something more of a psycho who has absolutely no clue what he’s doing. Nevertheless, it is fascinating to see this man somehow become an extreme success in the world of street art. Thierry Guetta may be the film’s main star, but “Exit Through the Gift Shop” is always surrounded by the idea of Banksy. After all, this is a Banksy production. Even though he is nothing more than a man in a black hoodie with a muffled voice, he still feels so real and powerful. He also proves here that he is a multi-talented artist, not just mastering the world of street art, but also the world of filmmaking. Real or not, “Exit Through the Gift Shop” does exactly what it’s meant to do: explore the world of street art. It gives us a look at how street artists function in a way that is so close and exclusive that the viewer begins to become enveloped in the world itself. Notice the film barely uses the term “graffiti.” Instead, all the artists say “street art.” “Exit Through the Gift Shop” will make you more open minded about what art can be. What “Exit Through the Gift Shop” is really trying to answer (besides who its own director is) is this age old question: what is art? Nearly any object in the world can be taken and turned into art. What Banksy is really asking is this: maybe it isn’t. Could we be living in a world where the idea of artistic expression has been taken too far? That seems possible, especially in a world where people like Thierry Guetta can pick up a camera or a paint brush. “Exit Through the Gift Shop” becomes meta in that it is a film about the making of the film. It is like a behind the scenes documentary that is way more informative than the average behind the scenes documentary you’d find on Showtime. It is not really about the stars, but about the art that the stars create. 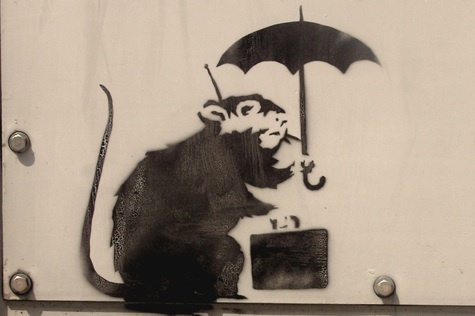 What Banksy has created a behind the scenes look not about himself, but about his art. 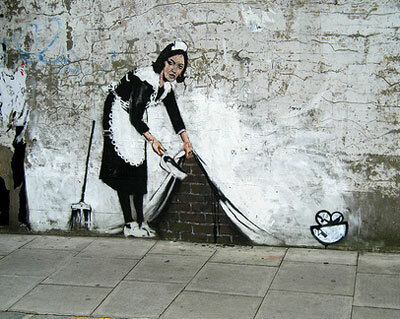 In that art, maybe the real Banksy can be found. I could be thinking to myself right now that it is a real shame that I didn’t see “Exit Through the Gift Shop” earlier on, for its brilliance deserves a spot on my list of the ten best films of 2010. However, I find it impossible to say that. “Exit Through the Gift Shop” doesn’t even deserve to be on a list of its own. Its unique, reality-bending view on art defies the entire idea of lists. This entry was posted in Banksy, British, Documentary, Exit Through the Gift Shop, Graffiti, Meta, Mockumentary, Movie Review, Street Art on January 6, 2011 by ian0592. Maybe Thierry Guetta is a hoax and was collaborating with Banksey the entire time in order to make the point: Street Art is being whored out by the public and media who don’t understand it. Also it could be commenting on the way the public will jump on any fad they feel is cool.